1. How could I have known this is what you wanted—because you never mentioned it? 2. The role of imagination in sensation may be underestimated. The highly sensitive may add imagination to sensation and thus perceive things, present and not present, that others cannot. 3. People express their desires reasonably clearly, but often they will not hear what their words are saying. If you respond to what has been expressed, it may seem to be you who is confused. 5. Suppose you continued to listen carefully to what people were saying, and in particular to the desires they expressed, but you responded as if they had said the opposite. Would you live in greater harmony? 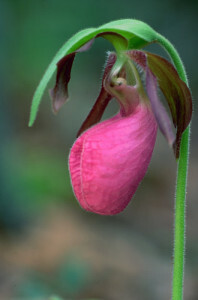 Photo of Cypripedium acaule (Pink ladies slipper) is by Thomas G. Barnes, University of Tennessee Herbarium.